I first saw Snowpiercer at the Busan Film Festival this past October. Rumors were already flying about Harvey Weinstein’s desire to cut twenty minutes from the film, and people were clamoring for tickets to this premiere. Seeing the film in a packed theater, in Korea no less, made the entire experience more exhilarating. Every plot twist and dab of horror seemed heightened. I felt like I was seeing something wholly original. Then too there was the opportunity to hear Bong Joon-ho speak about his film. He was such a great speaker: humorous and humble but really engaged with his audience. 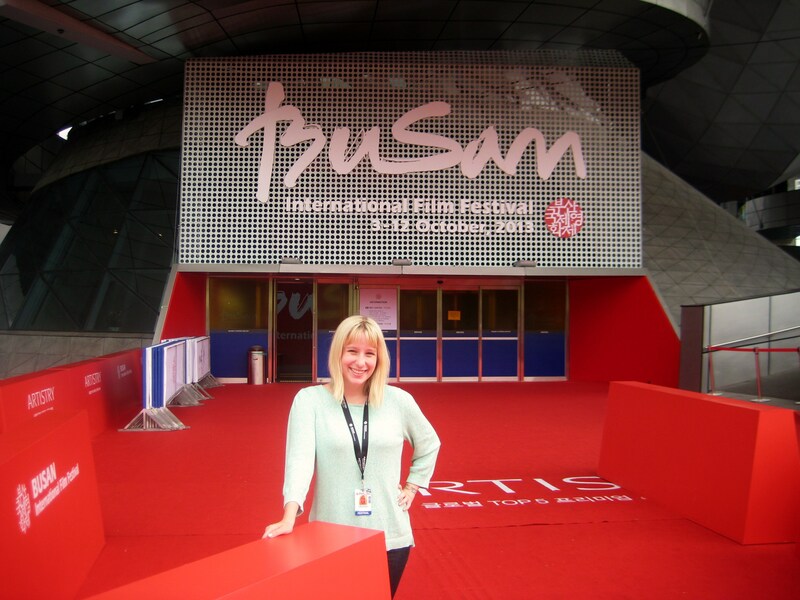 Me being a happy camper in Korea for the Busan Film Festival. I left Busan floored by Snowpiercer and very confused as to where any cuts could be made. If you’re not familiar with Bong Joon Ho’s other films (The Host, Memories of Murder, Mother, etc. ), he’s a concise filmmaker with every scene having some kind of narrative purpose. The idea of the film being cut was more horrifying to me than the contents of the film, which is filled with a good bit of gore and society driven dread. So when Snowpiercer was released in America, I knew I had to see what had happened to the film. And I had a totally different experience as a movie goer from my time in Korea. There were maybe eight people in the room and while they were responsive, nothing compares to the high of a packed theater with everyone’s emotions fueling the crowd. I also felt that all the twists that were so shocking the first time around seemed rather obvious the second time. So here are my thoughts on Snowpiercer after two viewings, a lot of feels, and a bit of distance. Bong Joon Ho’s first English film is a new kind of apocalypse tale a la chaos theory. Remember Jurassic Park? Ian Malcom? Ringing any bells? Basically it’s anything that can happen will happen. A highly controlled system like the life-giving train in Snowpiercer will inevitably find a way to disrupt the “natural order” of things. The film is set in a 2031, where humanity has frozen the planet in a botched attempt to cure global warming. The only survivors are the precious few that boarded an entirely self-sufficient train that circles the globe; its constant motion preventing its deep freeze. Inside the train, a class system based on initial ticket purchase is highly enforced. The Head lives in luxury while the Tail live stacked upon one another in squalor. Whenever someone from the Tail steps out of line, they are punished in a brutal frozen fashion with the removal of limb. Despite the environment of fear, unrest continues to grow and a rebellion is brewing with Curtis (Chris Evans) as its reluctant leader. At his side are his second in command, Edgar (Jaime Bell), Tanya (Octavia Spencer), whose child has been stolen by those at the Head, and the wizened guru of the Tail, Gilliam (John Hurt). Together with an untutored but dedicated army of Tail members, Curtis storms up the train in order to confront the mysterious engineer Wilford (Ed Harris). The story is based on a French graphic novel Le Transperceneige. Some of the artwork from the novel even appears in the film as the sketches of the tail’s Painter (Clark Middelton). The graphic novel aesthetic is strong throughout Snowpiercer and you get the sense that some stills could have been pulled directly from a comic panel. Not in the showy way of Sin City or 300, but the comic book effect is still there. Bong Joon Ho has said that he also wanted the film to feel like a video game in that there were levels and boss fights. Each car that Curtis and his crew progress through is shocking in its increasing luxury and full with gruesome challenges. In particular the scene where the Tail warriors take on a car full of masked, leather wearing butchers. While that may at first seem like a comical description, the sequence is bloody and terrifying and so unique to Korean cinema right now. If you were at all a fan of Park Chan-wook’s Oldboy, the butcher sequence is akin to the hammer in the hallway tracking shot in its brutality and slight humor. The key to enjoying this film is to not question anything. Don’t question the train car that replicates the ocean. Don’t question the rave car right before the engine room. Don’t question the polar bear. You have to give yourself over to the world of Snowpiercer or else the logic of the film quickly starts to falter. The first time, that unquestioning attitude is easy to immerse yourself in. On repeat viewing, it gets harder to ignore the logistical gaps. My ultimate feeling on this film is that it’s exciting and pulse-suspendingly good, but it does not hold up well to repeat viewings. Seeing it a second time, you catch more small details that give away the ending, which kind of drove me nuts while making me feel like a smarty-pants for catching them. For instance, the little hand gestures that reveal the horror of the train’s mechanical survival. They’re all over the place! And the second time around the horror and tears of some of the dramatic plot points were missing for me. The first time around, I cried when Edgar died and when Curtis confessed that he had killed Edgar’s mother. Big fat tears too. The second time all of that drama seemed like a natural conclusion (i.e. Curtis asks Edgar about his Mother way too much for it to be casual) and my eyes remained dry. For all the rumored angst over cutting the film down, I don’t recall much missing. Maybe a snippet of dialogue here or there, but I’m not even sure that any cuts were made. So that’s the good news, because you need all the information you can get to keep up with this film. Yet it’s a two-hour movie that does not feel overly long because of its fast pace. Image respectfully borrowed from kotaku.com. Putting aside the potential narrative issues, you need to see this film at least once for the acting alone. If you’re not aware of Song Kong-ho–a truly phenomenal Korean actor–this movie is a great introduction to his skills. Another gem of his is The Good, The Bad, and The Weird, which is another great one for those just dipping their toes into foreign film. Chris Evans shows off a grittier edge to his action star capabilities, and Octavia Spencer is at her sassy best. Then Tilda Swinton throws down a standout performance as Mason, the obsequious, rat-like steward of the train. Total side note, but I love that that woman is not afraid to get ugly. She can be breathtakingly beautiful in an almost alien way and then turn around and blow an audience away with an abominable looking character. Mini-tangent over. Having seen many of Bong Joon Ho’s films, I think Snowpiercer is my favorite. It’s a transnational production with financial backing from South Korea, US, Czech Republic, and France. The actors are also from a variety of countries, but most of the key players are either American or British. Still the core of this film is Korean in that it feels like the exciting stuff that’s coming out of Korean cinema right now, just slightly adapted for more Western palettes. I would definitely recommend this to viewers who are a little intimidated by foreign films because 95% of Snowpiercer is in English but you get a taste of a different cinematic style. If you like what you see then there are other excellent entry points to Korean cinema out there and they’re easy to get a hold of. I’d also recommend seeing Snowpiercer in theaters because it is stunning on the big screen. But I’m not sure I would add this to my personal collection of DVD and Blu-rays. So take from that what you will.